Perfectly petite and realistic dwarf sized carnations are easily replicated with the Small Camelia Carnation Die. 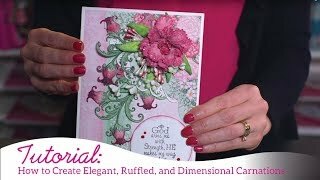 When paired with the delicately detailed cling stamp set, these delightful die cuts assemble quickly and easily to create a blossom that has all of the full ruffled details and layers of the real mini carnations found in your flower beds or the local flower shop! A wonderful assortment of petal sizes allow you to create the exact size of carnation needed for any card, scrapbook layout or altered art project! These dies are part of the Camelia Carnation Collection and pair with the Small Camelia Carnation Cling Stamp Set.This stamp and die combination has been created for use with the Floral Basics Shaping Mold as well as the Deluxe Flower Shaping Kit.